The space-funding company Uwingu is offering special Mother's Day certificates to people who name Mars craters for their moms by May 8, 2016. Is your mom a space fan? You could make her Mother's Day memorable by naming a Mars crater for her. 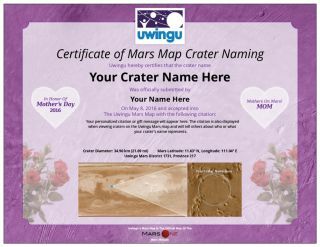 The space-funding company Uwingu is offering special Mother's Day certificates to anyone who buys a name for a Mars crater by Sunday (May 8). "Naming a Mars crater for mom is an out-of-this-world way to honor moms across the Earth with a magical connection to the universe," Uwingu CEO Alan Stern, who's also the principal investigator of NASA's New Horizons Pluto mission, said in a statement. "Help your mom join our MOM club — the Mothers on Mars club." Prices are based on crater size and start at $5 for the smallest ones. To date, more than 19,700 craters have been named in this way. Half of Uwingu's revenues go toward funding grants in space science and education, company officials said. To learn more about the company and its Mother's Day promotion, go to www.uwingu.com.